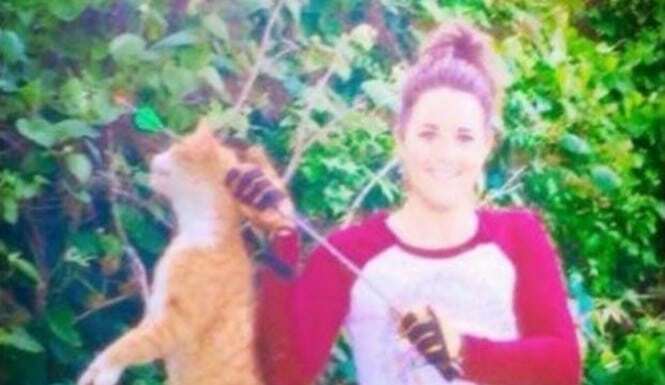 Did one vet go too far in posting images of a cat she hunted down in her backyard? 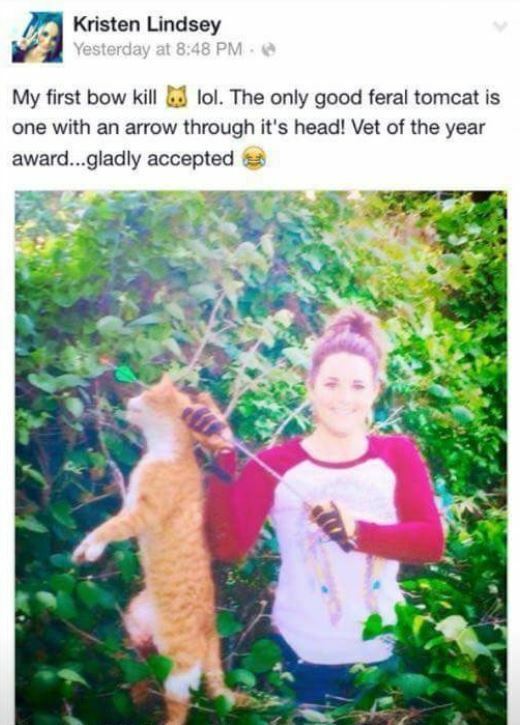 Kristen Lindsey, a veterinarian of the year has been fired from her clinic after posing pictures of her holding a cat which she had killed by firing an arrow into its head. In her post on Facebook (since deleted) the 31 year old woman explains how she hunted down the animal in her backyard, believing it to be feral. A rescue center would say the cat was in fact a domesticated cat called Tiger who had been missing for around two weeks. 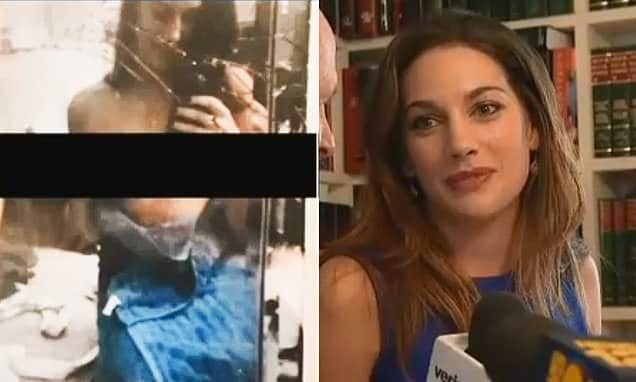 It would not be long before the vet came to be widely reviled for posting her images on Facebook before her employer, Washington Animal Clinic also took note and were forced to distance themselves from the woman before sending Lindsey her marching orders. Told a statement Friday morning from the vet’s former employer: ‘We are absolutely appalled, shocked, upset, and disgusted by the conduct. Also expressing their disgust was the Texas Veterinary Medical Association who told that the vet’s conduct did not reflect the standards of other vets. ‘We are saddened and disturbed by the unfortunate actions of this individual, and we remind Texas residents that this conduct is not reflective of the veterinary profession or of the veterinarians who strive to embody the words of the veterinarian’s oath every day. Adding: ‘We hope you will stand strong with us against this type of behavior against animals. TVMA values the trust built between veterinarians and the public based on mutually shared care for animals. ‘We hope that we can unite to prevent actions like this from occurring in the future. 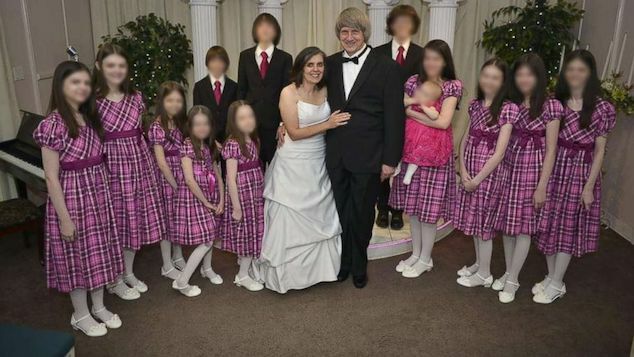 But it seems things aren’t just quite over for Kristen Lindsey as local prosecutors have also now intimated pressing charges agains the woman. Offered Austin County Sheriff Jack Brandes: ‘This kind of stuff shouldn’t happen in our society,’ Brandes said. ‘It’s a very sad thing. Lindsey interned at Equine Sports Medicine & Surgery in Weatherford from 2012 to 2013. She created a personal blog called Wyo-Girl-Kristen Lindsey and posted about herself in 2011, saying: ‘I love Wyoming and the mountains….the Big Horns especially…but any will do when it really comes down to it. A Facebook page, called ‘justice for the cat murdered by Kirsten Lindsey‘ has already been ‘liked’ by more than 7,000 people. A video of the six-year-old cat that Lindsey is believed to have killed riding on top of a tractor has also surfaced online. ‘house cats’ are carnivorous predators that have been domesticated by humans. I find it ironic to hear humans say that they have ‘fixed’ their cat. That implies the cat was ‘broken’, before they subjugated it and mutilated its reproductive organs. The only justifiable reason for rendering cats sterile is the belief there are already too many cats. If returned to the wild, ‘house cats’ will quickly revert to their natural state as predators or they will die from starvation and/or they will fall prey to another predator. I have witnessed a ‘house cat’ stalking a sparrow and in the next instant an eagle swooped down and carried it away. I have seen a large owl pursuing my neighbors pet dog at dusk. The dog escaped because the owl broke off the pursuit when it saw we humans. Just because the archer shot and killed a cat does not automatically result in a crime being committed. Texas law makes a provision for killing a cat, even someone’s pet cat, under certain conditions. (6) without the owner’s effective consent, causes bodily injury to an animal. (10) “Depredation” means the loss of or damage to agricultural crops, livestock, poultry, wildlife, or personal property. Please see section e, subsection 1. Please do a little work of your own and look up the Texas states legal definition of ‘depredation’. 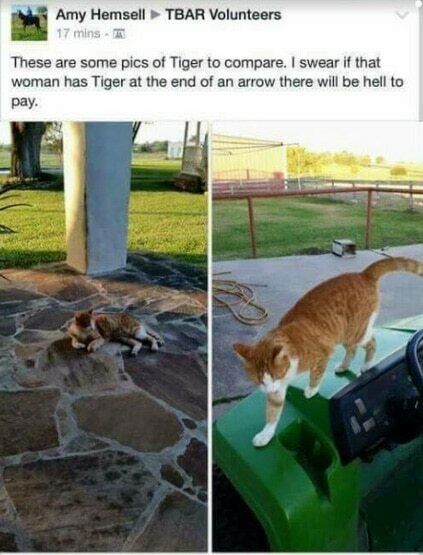 There are some folks who claim they can say for a mathematical certainty that the dead cat in the grainy low resolution photo is identical to the Gator riding cat in the video, known as Tiger. 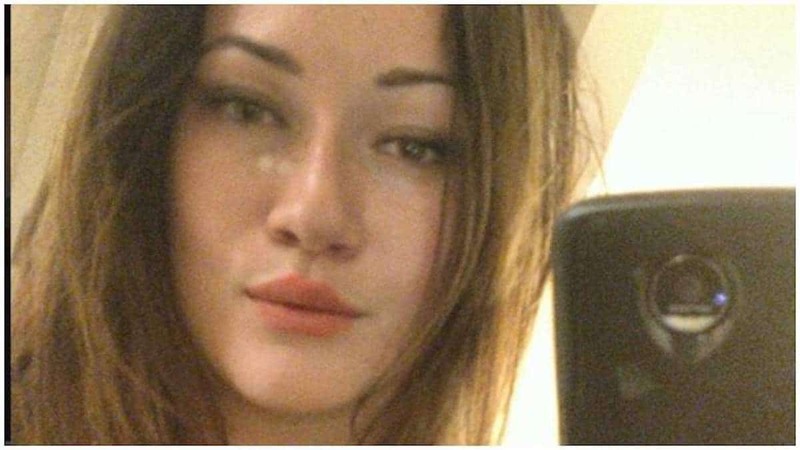 If you compare the photo of the female in the dead cat photo with the more recent photo of Kristen Lindsey, who is 31 years old today, then it is highly unlikely that dead cat is Tiger or that the dead cat was killed in Texas less than a month ago, unless Tiger and/or KL are both capable of traveling in space and time. KL was born 2-29-1984. She graduated from the University of Wyoming in 2006, but did not complete vet school at Colorado State University until 2012. She went to work as a vet in Texas that same year. Based on the apparent age difference between KL in the photo below I will make an educated guess that KL killed that cat some place other than Texas BEFORE she completed her undergraduate work in 2006. I stand corrected. Perhaps what I should have said is that until we stop the abuses that caused this problem to begin with, the best option we can find is TNR. There we agree 100%, target practice is unacceptable behavior. As for TNR, unfortunately I must disagree. The concencus amongst wildlife conservationists is that TNR is ineffective. The problem is TNR is very popular with animal welfare groups, this is the problem when one is asked to choose between fluffy kittens and saving less popular wild animals. Neither advocate is a bad person, and both advocates are taking a position that invariably leads to the death of one population or the other. I do suggest most cat lovers are unaware of the problems feral cats cause to the environment, but not many people spend years doing bird population surveys I guess. You don’t become native that quickly, it takes a long long time for an ecosystem to reach a balance. Being native means the surrounding parts of the ecosystem evolved with it. If a new predator is introduced the prey don’t always have time to evolve and adapt. It can take many many generations for that. The cats are worst in places like Virgin Islands, Madagascar and Australia. These places have no natural cats, and their ground nesting birds are vulnerable. They aren’t a problem wherever this girl was, which is why my grievances aren’t really appropriate for this article. I didn’t attempt to troll but invariably did. tg, cats are cats my friend. they all do the same things. house cats are not native though. And Lynx and mountain lion don’t have the same instincts as house cats, who were bred to hunt even when not hungry. Your point about bubonic plague is excellent. There was a similar disease outbreak in Texas following rattlesnake round ups. Rats also are not native, the Norway rat is all around the world now. She should have called animal control. House cats that make it to animal control generally have a less than 50/50 chance of making it out but better than nothing. If you know a private shelter they are far better. Private shelters can keep animals alive much longer. No one should jusf kill random cats, but honestly I’m incredibly fruatrated with the ignorance of people who let them outside. Please educate yourself on the subject, I’m no troll. I’ve rescued the ground birds myself. It’s sad when you know your pet died, it’s a different kind of sadness when you see a dead nest of birds, and you know there is less than 100 left in the wild. It’s not that I don’t like cats, I just realize you have to choose sometimes. if you read that and still think cats should be outside respond to me I’m curious. wouldn’t you think a better option would be to call Animal Control to have the cat picked up? The cat could have been chipped, identifying the correct contact information of owner of the pet. It’s one thing to advocate for responsible owner habits, it’s quite another to defend the point of view of a sick twisted woman who just wanted a trophy kill and a “look at me” moment on facebook. Which in turn, made her look like a cold blooded witch, neither an environmentalist nor a responsible veterinarian. Your “unique perspective” does little to paint you as an informed individual, it rather makes you look like a tool. To me allowing housecats outdoors is indefensible. But no not everyone should kill every cat. In Hawaii they are currently culling all the feral cats they can though, in an attempt to save their island. People have proposed pills that could permenantly neuter the cats, but introducing that type of chemical to the environment would have its own repurcussions. Listen it’s not an easy thing to solve but most of the general public is painfully ignorant about the consequences of allowing cats outside. Sorry but I see it from a rather unique perspective, I’m one of the few people out there who actually worked to keep track of our wild spaces and rehabilitate dwindling native species. So everyone should shoot at them with bows and arrows? There’s no way that millions of cats will not be outside, forever. So come up with a better plan than that. Quit trying to defend the indefensible. i may have made my point poorly and at a bad time. I stand by my assertion that cats shouldn’t be outside. I worked for several states before doing ground surveys of bird populations, with the question over and over of how to save their disappearing animals. The culprit for missing species of birds, lizards, small rodents is often roaming house cats. I’m not talking fewer of these animals, I’m talkin actual extinction. Cats have made more animals extinct than mankind the past century. I worked to save Mother Nature for decades, I worked at native animal rescue centers and at zoos. so while some may prefer cats, I prefer nature the way it was. We are loosing dozens of species every year, several to cats. No one should kill your pet, the woman was wrong to do that. But society needs to realize that letting their cats wonder is completely irresponsible. No one is entitled to allow their pet to wander the countryside unattended, no matter how cute and fuzzy. Yeah tragic to the family that lost their pet. They have my sympathies for sure. You have a big heart amybee, Im sure you’d be a better neighbor than that woman. Sometimes accidents happen and animals, though loved and cared for, get lost. 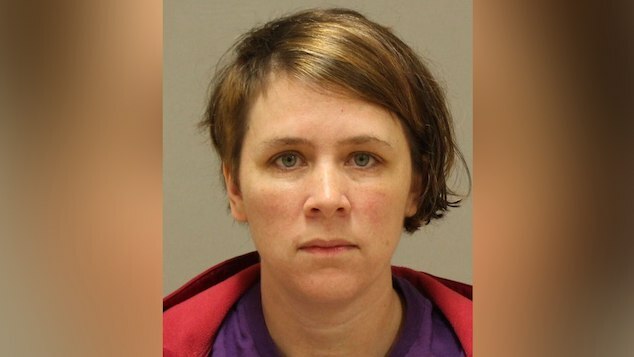 Maybe this bloodthirsty girl will mistake the neighbor’s dog for a rabid stray next time. Serves dumb asses who think they have to post every happening in their apparently pathetic lives to Facebook right. If you haven’t learned by now, don’t think there’s any hope for you. was it someones pet? it could be….. orange tabbies often look alike. perhaps if the owner of the cat hadn’t let it roam free they would still have their cat. listen, i like cats, but i like mother nature more. I have been involved with trying to save native animal species for decades, and the outdoor house cat is often the culprit, no one should allow them outdoors. How did this women ascertain it was a feral cat? She didn’t. Just shot and killed it, not caring that it was someone’s beloved pet. Hate to say it, but vets put millions of cats to sleep each year. Feral cats do NOT belong outside either, they are non-native animals that are responsible for more extinctions than man the past 100 years. I know people love em, but they shouldn’t be tolerated when feral. They don’t belong in nature. Isn’t it time to tar & feather her ?